This post is part of a series called North America’s Train Stations: What Makes Them Sustainable — or Not? See the series introduction for more. The photo above is how I used to think of Union Station: the architecturally famous Great Hall. But as the nation’s third largest station, I always wondered why so few people were in it. Before I share the answer, please allow this summary background. The Inexcusables are often trapped by lousy politics and solving each station’s flaw requires an effective governing structure. 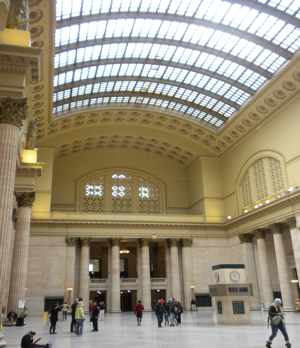 This article will expose that flaw for Chicago’s Union Station, the dominant hub in my hometown. Also typical of The Inexcusables, Union Station’s key flaws derive from mistakes made decades ago and that have not been publicly confessed; compounding the problem and raising the cost of solutions. These Inexcusable patterns betray the public’s trust and must be changed before the public invests sufficiently. In the final analysis, the Second City’s grandest station is the center of one of the nation’s largest, disintegrating transit networks. Today, agencies are broke and don’t seem to know how to correct their mistakes. Yet, this insolvency can be Chicago’s chance to make a new main station to lead this transit town into an era of sustainable transportation. Multiple proposals for a West Loop Transportation Center are promising, but collect dust due to lack of funding. To understand how this condition evolved and how we can break through it, let’s start this history when Union Station was helping Chicago become the nation’s rail center. Built by Burnham’s firm as a consortium of five competitors and led by the Pennsylvania RR (the nation’s largest railroad), Union Station tells us collaboration can serve everyone’s passengers better with easier transfers and, thereby, increase rail travel overall. In short, integrated systems lead to growth. When completed in 1922, Unions Station repeated a similar collaboration that built the central depot of the 1880s. To handle Chicago’s record-breaking growth during the previous three decades, the 1922 Station tripled capacity and innovated by terminating 24 northern and southern tracks into one convenient hub. All good… and soon-to-be-great. 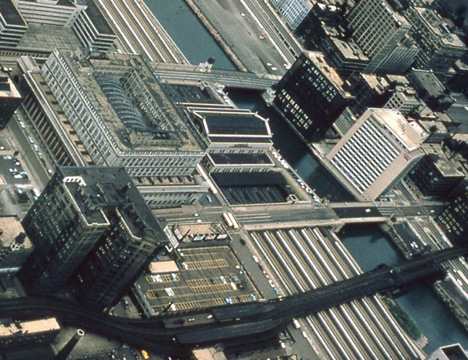 Boosting economic growth, this consolidation of five companies’ terminals allowed Chicago’s Central Business District to expand; having been hemmed in by eight rail-yards and terminals. Adapting the laws innovated for New York’s Grand Central Terminal, Chicago permitted 1920s’ office buildings to be built over tracks; thus expanding the CBD and its convenient access by commuters. The collaboration that built the 1880s depot and its replacement by the 1922 Station bookended Chicago’s ascent as the nation’s transportation center. This leverage, in turn, gave the metropolis the edge to emerge as the nation’s manufacturing center. Union Stations’ early economic triumphs are matched by its long-history of aesthetic awards. The most recent was in 2012 with a “Great Public Space” award given by the American Planning Association. This coincided with other accolades derived from the publicity around the $65 million update, mostly of the station’s Great Hall and Amtrak facilities. Key functions are off just enough to distort other aspects; multiplying dissatisfaction, particularly during rush hour. The causes are mid-century mistakes made when we thought inter-city train ridership would decline further and, hence, the Station could downsize. All inter-city travel lost from its 1940s peak has been replaced by commuter ridership, plus another 20% daily ridership in this century. 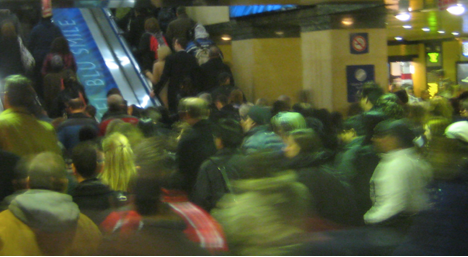 Union Station’s concourse overflows with passengers and cannot catch up with the times. The Station that helped make Chicago the nation’s train center now holds Chicago back. Serving as terminus for half of Chicagoland’s suburban lines, Union Station declined for the last half century; making passenger convenience worse. Telling the tale of the times that caused today’s divorce from rapid transit, Union Station had its own “L” (Elevated) stop per the 1957 photo above (Bruce Moffat Collection.) The Loop connection starts on the right, crosses the river and train-shed with the “L” stop in the parking lot. (Across the street, the existing Great Hall is in the middle of the 8 story office block with the original concourse to its right.) This neat track connecting to the CBD was demolished in 1958 to clear the block next to what would be the world’s tallest building for over two decades. Despite the huge increase in commuters who needed to circulate during three decades of the downtown’s redevelopment boom, Chicago never replaced the “L” station and kept Union Station disconnected from rapid transit. When considering that Union Station ridership would rank it as the 10th busiest American airport, we need to ask how many airports that large have inadequate rapid service. Since Chicago’s airports have had almost constant and continuing public investment for the past sixty years, the City’s investment priorities can only be felt as a protracted slap to two-thirds of downtown’s daily rail riders who have made Chicago’s economy work and probably contribute more than their fair share of taxes. 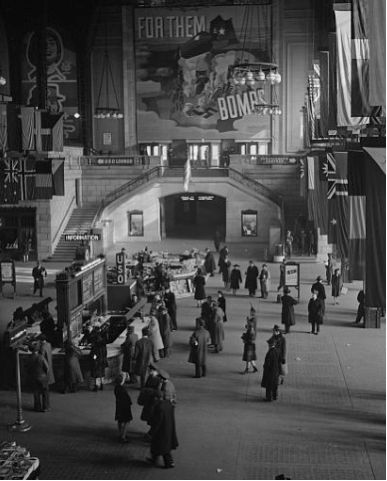 Union Station’s growth mostly was based on easier transfers and the high opinions of its 1922 Concourse (above shown serving the war effort.) The Concourse evoked New York’s exquisite 1903 Penn Station; yet both met mid-Century mistakes. Chicago’s concourse was demolished in 1969. Developers of the Concourse’s substitute and its high-rise office towers got their deals; but no agency got passengers a deal that respected the visual glory and artful functionality of their former Concourse. The 1970s design of the concourse’s substitute was so bad that an extensive $23 million renovation in 1992 (by a European star-architect) could not conceal the dirt that had been done: Chicago’s former train “cathedral” had been scrunched under an office tower. Today’s concourse is little more than a passenger pipeline dressed-up as a fast-food mall. I have been jostled through the concourse during several rush hours and I still find it confusing and claustrophobic. I’m still looking for a fellow traveler whose eyes do not seem glazed over. Seeming to reflect my feelings about leaving the concourse, the photo below is borrowed from the 2012 CDOT Plan referenced below. Municipal failure for an over-crowded concourse gets worse as rush hour passengers next are dumped into a street-level melee as they try to cross the river or Canal Street. This frequently looks like the breakdown of civil rules. Taxis, cars, busses compete for space that doesn’t exist; so they feel justified stopping in or racing through crosswalks. To avoid over-crowded sidewalks and crossings, pedestrians also get crazy; often jay-walking Canal Street and inventing new ways to defy common sense. Overall, this break-down of order converts an otherwise safe train commute into a hot zone endangering public safety once it encounters the street. Seeking to explain this failure in the primary job of government, I recall the field of mathematics that says human behavior is unpredictable when systems are at capacity. This Chaos Theory says things can go wrong spontaneously. The streets outside Union Station — at almost any daylight hour — proves to me the value of this Theory. As a final sign of system disintegration, only slow, noxious diesel buses directly serve a station with 125,000 daily weekday passengers, the nation’s third largest. Since only 11% of METRA riders get on a CTA bus, it has obvious limits. Those who choose to walk get a type of gallows satisfaction because the pedestrians often move faster than fellow commuters packed into a rush hour bus. To sum their personal experiences, transit commuters are doing the Right Thing and deserve much better. At the least, a decent deal would reward commuters with enough convenience to encourage more good behavior. Reflecting further government failure, Union Station’s owner (Amtrak) does not grasp the collaboration of 125 years ago that led to Chicago’s growth. The Station’s largest tenant (METRA) has so many scandals it is unlikely to survive the recommendations of the blue-ribbon committee appointed by the Governor. The same goes for the Regional Transportation “Authority.” Its four decades of failed oversight has allowed system dis-integration and agency waste of public funds. And Chicago’s Transit Authority carries baggage of recurring fiscal failures and two decades of deferred maintenance. Recognizing the uselessness of transit’s major operators, Mayor Emanuel has put in-charge Chicago’s Department of Transportation. CDOT capped off 12 years of downtown planning with its May 2012 “Union Station Master Plan.” While not as forthright as my analysis (and certainly not written in my style), The Plan is candid for a government document; which I see as a sign of hope. After wasting a decade of grand planning when the City had some cash, The 2012 Plan is practical… now that Chicago is flat broke. The Plan details improvements today, most of which are probably affordable. And it inspires some hope that its 5 to 10 year goals of realigning and widening Station platforms will help overcome crowding and, maybe, make more probable the benefits of through-routing. But… no funding, as yet. Finally, the Plan clearly knows a new station is required and repeats the long-term vision of an integrated West Loop Transportation Center (imagined above) that, rich in irony, could be built over the concourse demolished in 1969. The Plan also analyzes an alternate Center one block west and stretching two blocks north to the updated Ogilvie Transportation Center; thus making the economic benefits of through-routing theoretically possible for 8 of Chicagoland’s 12 lines. With commuter travel predicted to increase between 25% and 40% within two decades, this Center offers hope that Chicago transit could enter a sustainable era… hopefully closer to on-time. With history as judge, planning promises will not overcome the reality that governments are poorly aligned and, thus, are unlikely to spend tax dollars intelligently. But this dismal Big Picture gets more hopeful when we consider CDOT’s first small step to rebuild connectivity with a Loop Bus Rapid Transit. We hope BRT, sometime in 2015, will serve Chicago’s largest downtown buildings and reconnect the largest three commuter stations with the CTA’s rapid rail. There are reasons to side with skeptics saying that this BRT is not a suitable solution; particularly if this City continues to tout itself as a global hub while only able to implement BRT, a technology used by developing economies. But, BRT is all Chicago can afford; having lost taxpayer support by treating its transit customers for decades as second class. How Do We Convert Dis-integration Into Sustainable Integration? Even for someone who enjoys writing about the future, I’ve just made a tough ask here. But starting relative to today’s transportation agency dis-integration, the positives are that the Loop BRT can meet a very low standard and still be considered a success. Yet, BRT will not renew Chicagoans’ transit greatness as long as Union Station is stuck behind the times. Chicago’s boosters cannot mask much longer their inadequate downtown transit. This will lose the city its status as a global hub. While Public-Private Partnerships are floated to fund the low-hanging fruit, use of PPPs sufficient to make a new transit center will require reducing private risk with public funds. Politicians can pretend different and commuters can hope and pray (and buy lottery tickets), but anyone serious about transit must deal with reality: that public funds are the missing ingredient in updating Union Station and its transit network for the 21st Century. Obstacle: taxpayers have made it implicitly clear that they have lost faith in the current transportation regime fed mostly by sales taxes; having supported the regime, only to have it fail at maintaining itself in good working order… METRA disgracefully so. I boil down this analysis to the key strategic challenge of re-integration and how Chicagoans are likely to judge future investments: did their money for the West Loop Center replace non-integrated rapid and commuter rail with integrated systems that contribute to the economic and fiscal balance that the City needs to compete globally? Any future strategy will not work if decision-making authority still resides with agencies proven to avoid problems and whose directors are appointed by politicians who have not admitted past mistakes, nor promised to correct them. To get on track, Chicagoans must radically restructure bankrupt agencies; and probably start anew. To raise the funds to break beyond BRT, I advocate raising public capital and investing it through an independent publicly-elected Infrastructure Board. (Watch future posts for that proposal, separate from this series on stations.) This Board will be dedicated to increasing rail travel and protect future public investment by also serving as chief advocate for reducing the radical bias and subsidy to cars. As guardian of taxpayers’ new infrastructure capital to integrate systems and increase commuter convenience, this dual-dedicated Board could help re-organize transportation providers into a sustainable competitive collaboration and build a suitable West Loop Center. Another pipe-dream proposal? Hardly. Here is our lesson from history: collaboration twice (1883 and 1922) built stations that led Chicago’s prosperity. 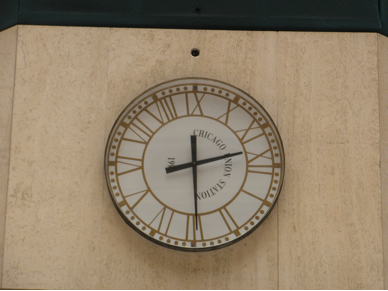 Both times, Chicago clearly had the ambition to be ahead of its time. Does it now? Good analysis. My (admittedly optimistic) view of current events is that a lot of the recent actions by the City of Chicago and CTA are intended to lay the groundwork for future megaprojects. We don’t get a Circle Line, we get an Ashland BRT. We don’t get a Red Line Modernization, we get a series of handsome station rebuilds. We don’t get a Red Line Extension, but we get a total reconstruction of the line and a grand new 95th St terminal. We don’t get a Carroll Ave or Monroe St busway, but we get the East-West BRT. And yes, instead of the West Loop Transportation Center, we get the Union Station Master Plan. Politicians love projects (jobs+money), but the case for huge megaprojects is seriously weakened by the comparison with the status quo. If the various agencies haven’t taken advantage of all the easy fixes to major problems, why should taxpayers pay for the grand solution? They have no credibility when it comes to planning. This is at least superficially similar to LA, where the rail-expansionist mania of the 80s/early 90s was terminated by a methane explosion and Bus Riders Union protests. Metro then spent 15 years building credibility, consensus, and support while implementing common-sense improvements like MetroRapid. This later paid off in spectacular fashion when voters in 2008 approved Measure R, opening up $40bn in funding for transportation. This is a great summary of Union Station. It is criminal that they demolished the head house and have everyone enter through the basement isn’t it? I hear Metra is thinking of diverting a line into the afterthought station on LaSalle st. I read a Chicago plan about a decade ago to make a blue line extension that would wrap through canal street and stop at Union Station and Olgvie. Do you think that is worth pursuing? If Daley hasn’t wasted all that money on the airport express it might have a chance but no money now, sadly. Despite my critique, I also see some positives as well with the new Mayor. But progress is constrained radically by today’s red ink which has only just started to flow. Your analogy to LA is interesting and somewhat generates hope; but today’s chronic fiscal crises make even a decade-long credibility-building seem too late. Partly based on what you have said, I think it makes more sense to shape a strategy of new institutions around the PPP legislation. Transit operators reflect the dysfunction and abysmal fiscal condition of our governments. Thanks. This has been the most enjoyable piece to write in the series. If I hadn’t written it, I probably wouldn’t have realized what tragic consequences the demolition of the concourse had. It was the mid-Century hubris that the autos ascent would continue and trains would decline. Both very wrong today. And, now we are broke. On METRA moving a line to Lasalle station… I can’t hurt. Curiously, that new station has almost immediate access to the Blue Line and the Green Line… right across the street. Other than lack of money, I’m not sure why the CTA abandoned that Blue Line proposal down Canal that you mention. It seems to me it is worked into the West Side Center, but such a mega-project is out of the question if it is controlled by a government that can’t pay its obligations. Another example of my point about setting up a new type of authority that invests tax dollars well. Value capture funding has yet to be fully optimized in the U.S. though it is no stranger to America, for it was the key funding tool in the construction of the Transcontinental Railway during the 19th Century, and there are some modern uses of it in business improvement district redevelopments, and the 62-mile Cotton Belt Rail Line in Texas. It has been used to fund BRTs in BogotÃ¡, Columbia and Sao Paulo, Brazil; and more recently Shenzhen, China, is launching a billion dollar MRT via value capture. The leveraging of value capture funding reduces costs for state and local budgets, aligns future infrastructure investment to be highly feasible, and generates cross-support from private sector interests for such infrastructural investments. Opportunities to pay for infrastructure via leveraging property values may range in vastness and scope; however value capture remains consistently viable and overall for all diverse components involved is a WIN-WIN formula for success. The “L” system’s old Canal station (the one in that great aerial photo) wasn’t just demolished to make way for tall buildings; a parking garage — natch — stands in its place today. The entire Garfield Park branch of the system was torn down in to make way for the Congress Expressway (now the Eisenhower, a.k.a. I-290). This also doomed the Chicago Aurora & Elgin interurban line, which connected to the Loop from the western suburbs via the “L” and served the station until 1953. I guess I don’t think the situation is quite so unmanageable. The city is regaining political power in the region as it gobbles up an increasing share of Chicagoland’s elite. That urban elite increasingly understands the crucial role of investment in public transportation, and even the need to integrate systems. It’s easy to be cynical, but there’s no better time to be hopeful. The organization of Chicagoland’s transit systems is under serious re-examination, and drastically different structures may result. This is a once-in-a-generation chance to break down the institutional barriers, and those are the crux of most transit problems. The shocking revelations at Metra will be matched by shocking reforms. Thanks for raising the concept of Value Capture. Worldwide, it has built some of the best rail networks and is still the driving force in the world’s best rails in Japan. The Metropolitan Planning Council has raised this possibility using examples such as San Francisco and Denver. Both of New York’s main stations also plan to use this to remake Penn Station and upgrade GCT. Despite our history of using it in the 19th Century quite brilliantly, most of 20th Century practice and law has erased the concept. Rails are reduced to highly regulated sometimes quasi-government corporations and have no interest in land or aptitude for redeveloping it. And now, the operators of all passenger rails are bankrupt governments. As wild an imagination as I may have, I don’t see how the private sector invests alongside the CTA, the RTA or the State of Illinois and expects these dysfunctional agencies to repay the investment. So, we have to create new institutions to utilize Value Capture. For now, I hope this also answers Jon Davis: I’m still working on the Infrastructure Board proposal. It will have to be a clever piece of work to bring the public and private sectors together and convince taxpayers to come up with their share. Clever, but necessary. First thank you for calling out the vandals who wrecked CUS. As someone who used it often before the debacle, I was appalled by the cramped labyrinth which resulted. That said, if Chicago has any serious desire for improved transit the politics of wasting the money on conveniencing sprawlburbs has to end. While CTA may misspend funds (and undoubtedly suffers the same absenteeism and low productivity we see in San Francisco’s Muni and BART) the money has to be invented and the improvements built. Building a Pink Line spur down Canal and restoring the “intermodal station” over the south train shed would be a start–with the restored L circling the Loop and coming back to Union before heading west to Douglas Park. Further in the future, the Saint Charles Air Line should be taken over for passenger use exclusively so that Metra can connect from McCormick Place to CUS. I am only an occasional user of Union Station – with my last use being about two months ago. Following a business meeting at an office building directly across the South Branch of the Chicago River, I had an hour or two to kill before catching the Hiawatha line back to Milwaukee. Returning to the station with what I assumed would be an adequate cushion of time, I was astonished at how difficult it seemed to be to find the main entrance, and then to find the gate to Hiawatha boarding platform. Ended up missing the train. My assumption was that the main entrance to a major train station would be intuitively obvious (a key focal point in the design), and also that the building design would divert passengers to a central area to which all boarding platforms would have a direct connection (as is the case for nearly every great train station in Europe). Not the case at Union Station, and your article confirms the odd dysfuntional design that somehow has persisted to the present day. Fortunately, another few hours exploring downtown Chicago is seldom a bad thing. Robert, thanks so very much for your insight (and refreshing humor) on VCF; it’s just unfortunate that its original intent has not been keenly adhered by development agents in today’s high complexities and diversions. Hopefully a new model (or return to tried-n-true basics) with new institutions, as you say, will emerge, and certainly the Dallas conference is a step in the right direction. On a side tangent note, I’m just curious if you have studied the Porto Alegre Model? If so, I wondered if you had any thoughts on it. I think it’s interesting in a local microcosmic sort of way. I understand that in the end it had revolutionized and greatly enhanced the city’s economies of scale, an ideal outcome to say the least. They had employed an extremely aggressive version of VCF. During the 90s rapid population growth of Porto Alegre greedy speculators monopolized undeveloped lots in the urban core, consequently creating a housing shortage. This produced urban flight and sprawl outwardly into suburban ghettos. To counter this, officials set up incentives for property owners encouraging development of vacant land while also activating a property value increment tax to help capture increased values from the metro’s investment. Consequently, by championing development in proximity to exiting city core infrastructure, property tax revenues increased significantly resulting in the municipality to not just provide public transportation but also educational expansion, street cleaning, and increased police protection for low-income residents at a fraction of the previous standard costs. Hence, a more secure and steady revenue conduit was generated for Porto Alegre, coupled with higher property values for downtown developers and property owners. I’d appreciate any of your thoughts on this… Thanks. Instead of the many technical fixes discussed by others’ Comments, I’m addressing your point because all technical fixes don’t get done unless transportation first has its mandatory political reforms and wins taxpayers’ trust. Curiously, I agree with almost everything you say. And you may disagree with this, but I think I’m an optimist! (And thanks for the link to the Crain’s article… the columnist said it much more diplomatically than I could.) The article reinforces my conclusion that transit advocates need to divorce from the political control of current agencies. Currently, I think it makes sense to draw the line for most significant unfunded, future improvements (such as correcting Union Station’s platforms). Where you and I probably disagree is about the scenario. Mine tells me this… For the next decade, every agency will have its top priority to reactively protect and, later, rebuild its ability to borrow money. Until the ability to borrow-at-good-rates is restored, every agency (and especially transit) cannot put its plans into reality. This may not be evident now, but it will be after Rahm’s reelection in 15 months. By then, the state will have increased the income tax by, perhaps, another 3% (instead of rescinding the January 2011 post-election increase as promised then.) Knowing that Illinois is of no fiscal help, Rahm needs to protect the City’s rating and stings us with another property tax increase. Chicago’s latent taxpayer revolt (which Daley saw) becomes blatant. Unfortunately trapped in this melee, transit is positioned as the hindquarter of public services. It doesn’t get over the fence. It is the sacrificial lamb because the political players know Americans love their cars and have silent contempt for transit. All CDOT and CMAP plans continue to sit on the shelf. Today’s two decades of deferred maintenance grows to three. I pray for your happier scenario that today’s agencies can save transit. But I’m also becoming an old man; recently a sexagenarian whose span has seen one of the world’s best transit systems deteriorate to inescapably second class. I suspect our way out of that second class hole can be found by working the limits of the new PPP statute. But I’ve just started analyzing that and any useful proposal that can win taxpayer support is several months into 2014. Since you have thought carefully and studied transit, please send your email address to robertmunson@earthlink.net so we can continue this discussion without boring Aaron’s national readers about Chicago’s problems. Thanks! I owe you a response. But, this is also a series on stations that reward the good behavior of people who commute using choo-choo trains. 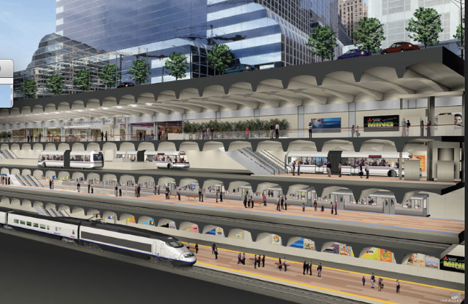 how does Value Capture work for the air rights to the West Loop Transportation Center ? And who protects the public so our children don’t get stuck for another five decades in a fundamentally lousy deal as when bankrupt Penn Central sold off the air rights of our beloved concourse? Robert, the answer to the “who protects” question is “nobody.” In Hong Kong, government handouts of cheap land to the MTR (which is making a profit on operations alone anyway, and doesn’t actually need the land) have recently come under attack for not going through a competitive auction process, to see whether other developers might offer a better price than the MTR. Value capture is a broken model and just looks nice because foregone tax revenues are obscure whereas direct government expenditure is obvious and subject to criticism. My view of value capture is a land value tax, not giving free real estate to transport companies. I think this is a very appropriate way to fund major infrastructure improvements, as those improvements bestow large unearned windfall increases the value of adjacent land. By capturing a large portion of that value, you also reduce the incentives to engage in rent seeking behavior to influence where the highway goes and such.